Wow, it’s April already and spring is here but I’m afraid that I’m still working on a winter project so no spring colors this week. Back in January I started a piece that had lots of 4½″ squares with ¼ circles added to them, I was having fun playing with the Carefree Curves circle templates. Now it’s time to put these squares together but keeping track of them could be a challenge. So today I’m going to talk about 4 tips for keeping your quilt pieces in order as you sew them together – no reverse sewing today! When I pulled out the project to continue working on it I realized I still had a lot of work to do. My original layout has gone and I have come up with a new layout that I like better and it uses up more of the shapes I made last month. I tend to like symmetry in my designs and this one will be no exception. First things first I need to finish putting bias strips around all of the ¼ circles before I can sew the squares together. Here the bias strips are all sewn in place. Doesn’t that Sulky rayon thread just shine on the dark teal fabric? I’m very happy with how the light thread contrasts with the dark fabric. Lay out all the pieces on a design wall. Working off a design wall means that you can work on sections at a time but still see the whole project and keep track of where everything goes. At one time I used a bed to lay everything out on but it’s hard to see the whole picture on a bed. The design wall that you stand back from and look at from a distance works a whole lot better to see the whole picture at once. Take a picture. A picture is worth a thousand words and it tells you where each piece is suppose to be when you can’t remember. More times than not I have mixed up the pieces and since I took a picture it was easy to see what I had done wrong so the fix was quick. Without a picture it takes a lot longer to see where the piece was turned the wrong way. Label your pieces. Use numbers, letters or a combination of each. Use small sticky labels to write the row number and position letter on. Masking tape works but I found that if ironed too much it’s hard to peel off the fabric and leaves a sticky residue whereas the sticky labels don’t. 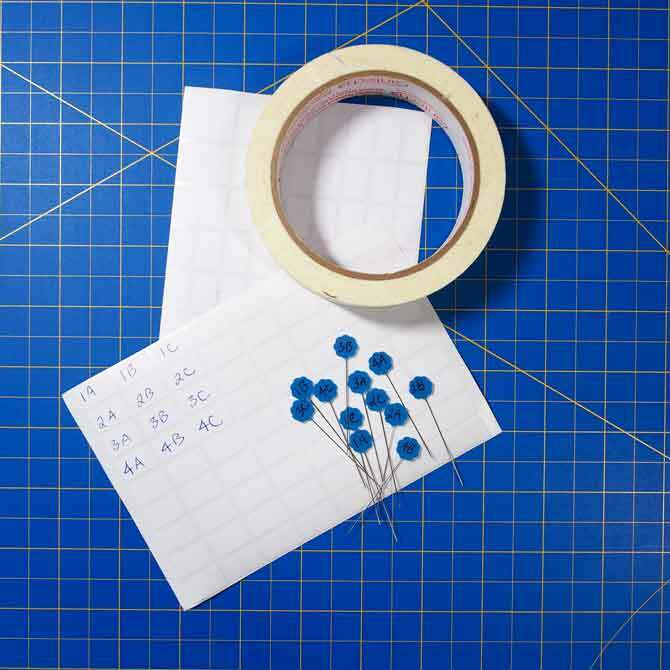 Or use flower head pins with numbers and letters written on in marker. You can also purchase already numbered pins from your LQS – I unfortunately, do not have any so I made my own. Lay out the block you’re working on in order by your sewing machine when sewing it together, this will ensure that each piece is placed in the appropriate spot when sewn together – well unless the little gremlins who hide in the closet come and mess them up when you aren’t looking. Note I have sticky notes on mine as well. I tend to use all 4 methods to keep track of my pieces that way I shouldn’t have to do any reverse sewing because nothing gets mixed up. 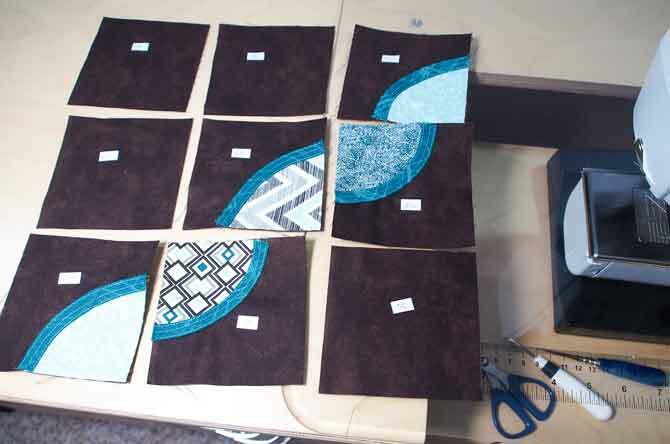 All those 4½″ squares are sewn into either 9 patch or 12 patch blocks waiting for the center to be decided upon. I’m going to put one of the wagon wheel designs in the center. But oh no, I ran out of the pre-made fusible tape that goes with the Clover fusible bias tape maker. What to do? No worries, I’ll use the bias tape maker to press the strip of fabric into the right shape and size. 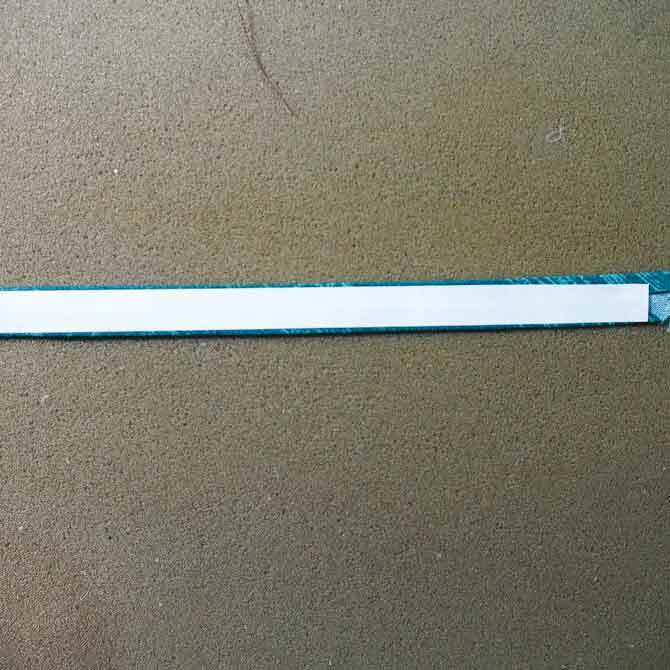 Then cut a piece of Heat ’n Bond Lite and iron it to the back side of the bias tape. It worked like a charm and I’m back in business. 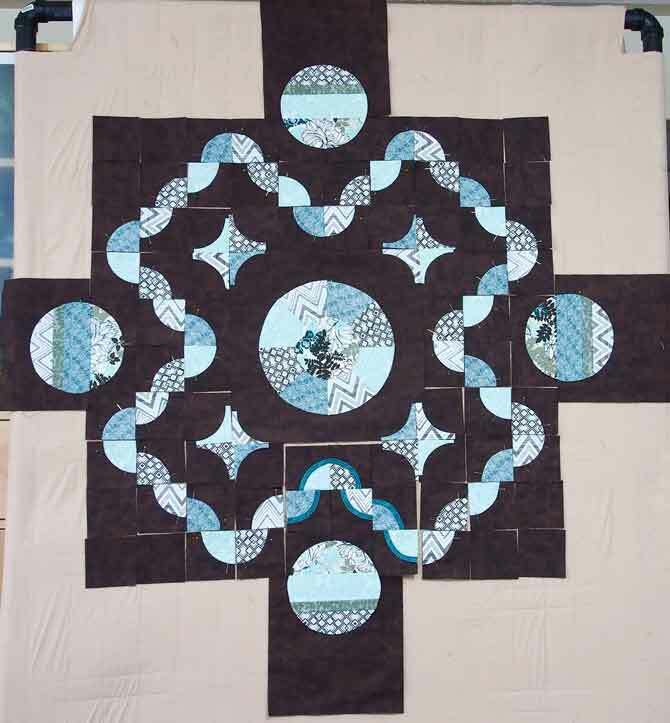 The center of this quilt is done and isn’t the symmetry of the design wonderful. 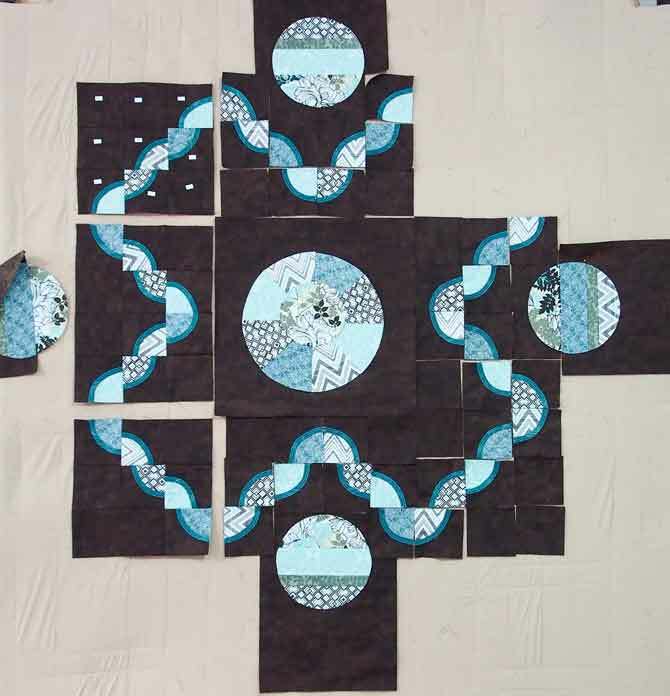 As you can see I added the circles which are going to flow into the border but that’s for tomorrow along with some tips on quilting. Today I had an easy time sewing all the 4½″ squares together with no reverse sewing and no mix ups thanks to using those 4 tips for keeping your quilt pieces in order. Happy Quilting. I am always so terrified to start big quilting projects because in the past I’ve had major headaches associated with misplaced/ out of place pieces. How ridiculous is it that I never thought to label my pieces?? I would layout my pattern (loose) and take a photo with my cellphone before taking that apart and sewing my blocks in. Also – this quilt is stunning! Photographing your layout is a great idea! I also take pictures to check my quilts for any mistakes I have made when laying it out before and after I sew rows together. I have been surprised several times when I have found a mistake I can see clearly in the photo but not when just looking at it laid out or on a design wall. I love the camera idea! I don’t have space for a design wall, so this would work great for me! Thanks! Wonderful tips. 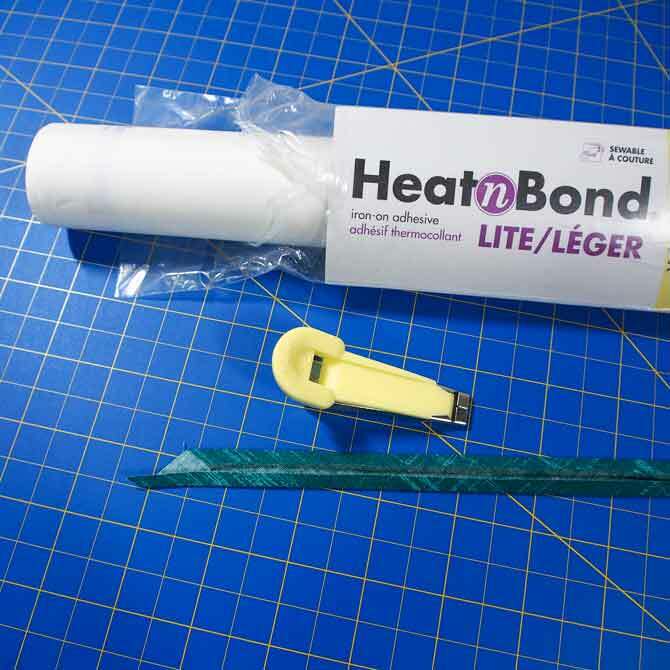 Another great tip for Heat n Bond. Great tips. I like the suggestion to take a picture of the layout. Great post. Thanks for all the tips. This is so beautiful I could stare at the light blue circles and pretend they are sky or water. 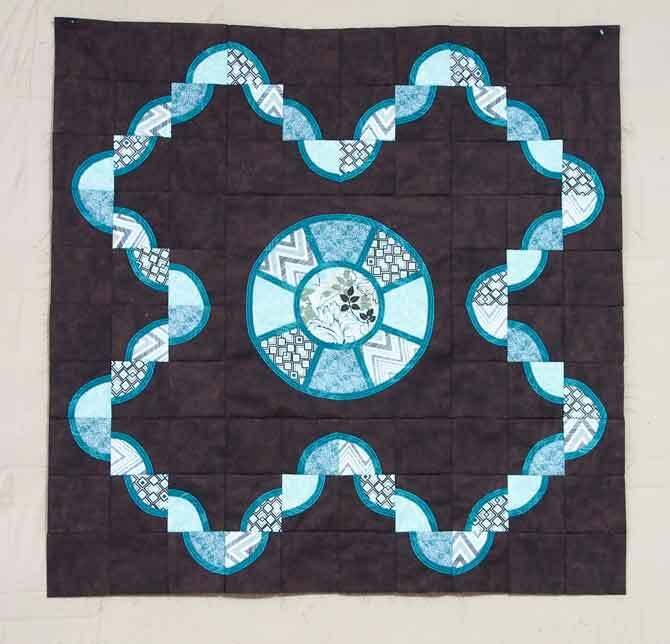 ty for your tips and ideas this quilt is very very pretty ty for sharing…. [email protected]……. Taking photos makes so much sense now that everyone has cell phones with cameras. Too bad for me that I overlooked the obvious while making my last quilt!!! I discovered too late that my “Super Sticky” post-its weren’t so sticky! I am going to follow your lead and use at least two methods….it is always a good idea to have a backup plan!